Summer is over. This fall, fortify your finances to take the end of the year in stride. These helpful tips will get you back on track (and help you stay on track) budget-wise. Instead of making a mad rush for last-minute deals, spread out your gift buying over the course of the next couple months. Watch your local circulars and emails for discounts and promo codes, and strike while the proverbial iron seems hot. For instance, I just purchased several packs of Calvin Klein undies as a Christmas gift for my boo because I received an email for 25 percent off, plus I had an additional 15 percent off coupon with free shipping. Will there be steeper discounts in the near future? I can't be sure, but I had enough savings stacked up to feel like I made a smart choice, and now I can check one more gift off my list. If you haven't already — and your budget can tolerate it — try to max out your 401(k) and 403(b) contributions at work. The employee contribution limit for 2017 is $18,000, and if you haven't reached that, it's time to come as close as you can. Those over age 50 can contribute an additional $6,000 as a catch-up contribution. If your employer offers matching funds, this should be a top financial priority, lest you fail to claim thousands of dollars in free money. Personally, I loved layaway in my early 20s when I was on a shoestring budget. It allowed me to plan ahead and make scheduled payments so everything would be ready to go by Christmas. It's certainly a helpful buying tactic to look into if your finances are tight but you still want to participate in gift giving. If you're lucky enough to have a flexible spending account through your employer, your FSA may need to be spent by year's end. Try to use up the balance so you're not losing cash. In doing so, you'll free up funds elsewhere that you don't have to use on medical needs. "Since 2013, your employer may offer one of two carry-over options," says Ryan McPherson, founder of the financial planning firm Intelligent Worth in Atlanta, Georgia. "One — roll up to $500 of unused funds into the following year or two, offer a two-and-a-half month grace period during which you may use your unspent FSA balance. Check with your employer, because offering one of these options is not a requirement. If you don't have either of these carry-over options and expect to have money left in your FSA, try to move appointments and medical/dental-related purchases (i.e., eye glasses or contacts) into 2017." Everything about winter costs more than other times of the year, and you should prepare by revising your budget to make sure all bases are covered. Upfront coupons and savings are great, but there's plenty more to be had on the back end if you know where to look. Apps like Ibotta and Fetch Rewards provide cash back on purchases made on preset items or at selected retailers. Last month I scored more than $50 cash back (which was on top of other savings I received on the front end) by shopping through Ibotta. You may be able to shave some money off your bills this fall by reviewing your insurance coverage. Michael Landsberg, CFP and founder of Landsberg Bennett Private Wealth Management in Punta Gorda, Florida, recommends rebidding your auto and home insurance policies to at least three independent agents (but not the online ones that are all owned by the same companies). "Often times, this rebidding process puts hundreds if not thousands back in people's pockets right before the holidays," he explains. "It's very easy. Just take your current policy declaration page and send that to an independent agent and let them do the work. The worst that can happen is you find out you've got a good program in place already." If you're carrying a high balance on a credit card, now is a great time to give yourself a credit card checkup. "Explore what's out there," advises Han Chang, co-founder of InvestmentZen. "Many lenders are beginning to offer deals now to get a jump on the holidays. Consolidating credit card debt via a balance transfer can be pretty enticing, especially with those 0 percent introductory APR offers, which usually last for six to 12 months. 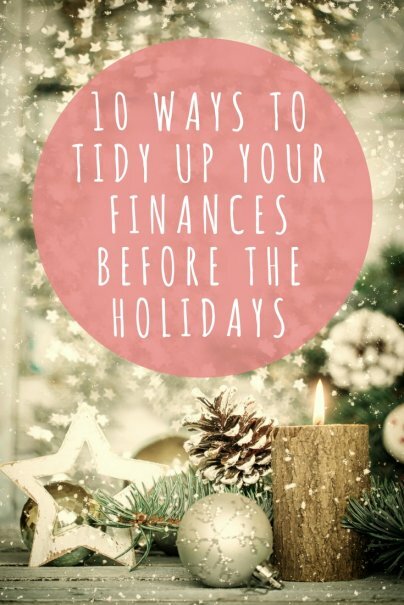 If you can find a good offer, you could potentially pay down a significant amount of debt before November and December."